A new group of hacker collective group calling themselves 'The Unknowns' had claimed to breach the security system of a range of government agencies, organizations & many high profile sites. According to a PasteBin release The Unknowns said that they hacked into ten different organizations and published documents and other data alleged to have originated from the servers. Among them there are NASA - Glenn Research Center, US military, US AIR FORCE, European Space Agency, Thai Royal Navy, Harvard, Renault Company, French ministry of Defense, Bahrain Ministry of Defense and Jordanian Yellow Pages. NASA has confirmed that an attack did take place on 20 April, but noted that no "sensitive or controlled information" was compromised. 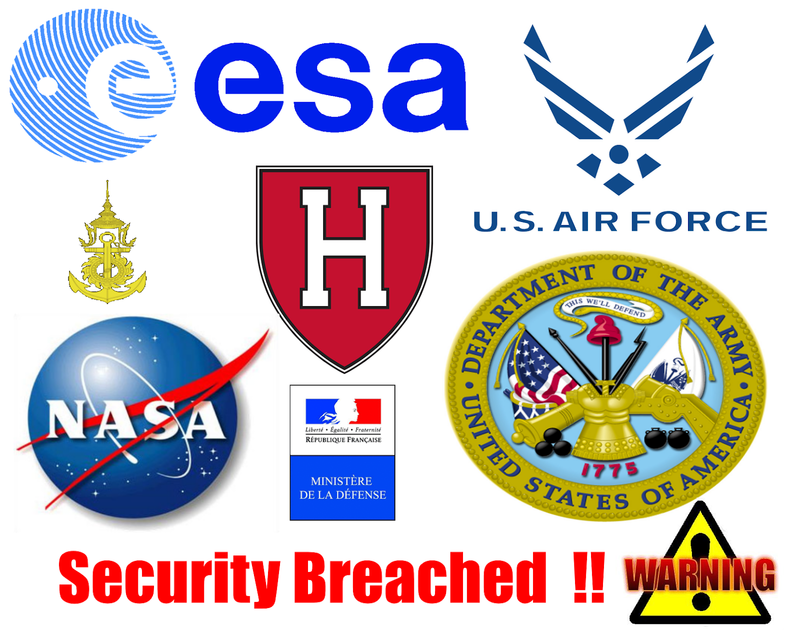 The ESA also admitted to having suffered an attack, which it said made use of SQL injection. The hacker group claims that their mission is not malicious, but rather to help. "Victims, we have released some of your documents and data, we probably harmed you a bit but that's not really our goal because if it was then all of your websites would be completely defaced but we know that within a week or two," said the groups post, "the vulnerabilities we found will be patched and that’s what we're looking for." In other word they are pretending to be 'White Hat'. If you dig the history you will find that previously NASA was hit many times by the hackers from different part of the world Such as Spamers targeted NASA, TeaMp0isoN hacked NASA official forum, Chinese Hackers hit NASA satellites, Indian hacker minhal stole secrete information from NASA, Code Smasher has found CSRF vulnerability in the official website of Virtual Heliospheric Observeatory NASA and so on.